Walter Ullrich, president and CEO of the Houston Technology Center, talked to Bauer Business Focus host Andrew Schneider about the organization’s work to diversify the Houston economy. 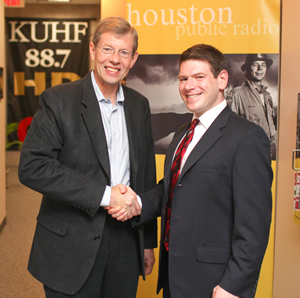 On Bauer Business Focus — A conversation about the future of the technology industry in Houston, with Andrew Schneider, business reporter for KUHF 88.7 FM. Founded by Houston business leaders in the late ‘90s, Houston Technology Center is a business accelerator and the largest technology business incubator in Texas, helping Houston- based entrepreneurs with the commercialization of their emerging technology companies. Walter Ulrich, President and CEO of the Houston Technology Center, visited Bauer Business Focus recently to talk about the Houston Technology Center and the benefits it offers, not only to entrepreneurs, but to the Houston community as well. Houston’s technology industry traditionally has dealt with mainly the oil business, he said, but the Houston Technology Center has worked to help the community realize the many benefits of technology diversification. In addition to helping to create jobs locally by investing in Houston-based companies, the Houston Technology Center also guides new entrepreneurs, he added. By working side-by-side with emerging technology, entrepreneurs have the ability to face challenges and recognize opportunities to improve their business and technology planning and produce companies that create jobs, Ulrich said. The group also faces the challenge of keeping recent college graduates in Houston to find technology jobs.